Are State Workplace Preemption Laws on the Rise? July 18 — A growing number of states are barring cities, towns and counties from enacting workplace wage, benefit and anti-discrimination laws and those localities have limited means to challenge them. Generally, state preemption is a legal doctrine providing that state laws take precedence over local laws or regulations that conflict with or are inconsistent with state laws. “Since 2011, there's been a very large increase in the number of states passing preemption laws as well as in the scope of those laws,” said Gordon Lafer, a research associate with the Economic Policy Institute in Washington. At least 22 states expressly preempt localities from adopting laws that, for example, raise minimum wages, provide leave benefits or expand workplace anti-discrimination protections past requirements set by federal or state law, according to Bloomberg BNA research. Most have enacted those laws within the last five years, and lawmakers in about 11 other states have introduced similar bills so far in 2016. Some observers attribute the trend to conflict between “progressive” cities and “conservative” legislatures and governor's offices. Others believe preemption laws can stem from non-partisan issues that vary from state to state. Localities have little recourse once states enact such laws, observers said, although a U.S. Supreme Court ruling from 1996 might support certain constitutional challenges against those laws. There's been a shift in the dynamics of power at the state and local levels during the past few decades, Brooks Rainwater, director of the National League of Cities' City Solutions and Applied Research Center, told Bloomberg BNA. In the 1990s, states were generally the “laboratories of innovation,” a mantle that has since shifted to localities over time, he said. Although some states have adopted some laws that might have originated in cities or counties, others have opposed them, Rainwater said. Those elections were the first to follow the U.S. Supreme Court's ruling in Citizens United v. Federal Election Commission, 558 U.S. 310 (2010), he said. The court held 5-4 that the First Amendment prohibited government restriction of political expenditures by nonprofit corporations. The ruling resulted in a “flood of money” contributed to candidates in state elections, Lafer said. He noted that a wave of conservative Tea Party candidates were elected to state office in November 2010. In the years following, Lafer said, the federal government became deadlocked on certain economic and employment issues, such as whether to raise the minimum wage. Those issues shifted to the states, with national organizations, such as the American Legislative Exchange Council, and other corporate-funded organizations concentrating on state legislative agendas, he said. ALEC includes state legislators and private sector members “dedicated to the principles of limited government, free markets and federalism,” according to its website. ALEC has circulated a model bill to preempt local “living wage” mandates, for example. Jon Russell, director of the American City County Exchange, a division of ALEC, told Bloomberg BNA that members of his group also are expected to approve model legislative language at its next meeting July 27-29 for municipalities to pass in order to “support” state minimum wage laws. In many cases, local ordinances on the minimum wage or other “politically driven issues” are the product of “special interest groups at the local level who cannot pass their agenda in state house,” Russell said. Laura Huizar, a staff attorney with the National Employment Law Project in Washington, told Bloomberg BNA that the organization believes state minimum wage preemption laws represent a “concerted, coordinated push back” against the “Fight for 15” movement that has gained traction in the past few years that seeks to raise the minimum wage to $15 an hour in the fast-food and other low-wage sectors. The federal minimum wage currently is $7.25 per hour, but state minimums range from $7.25 per hour to $10 per hour, as of January 2016. According to NELP, 14 cities, counties and states have approved measures to raise their minimum wage to $15 per hour over the course of several years. Rainwater and Lafer, however, said they don't believe the trend is strictly partisan. “It appears to be a mixture of politics, state-specific policy and different business interests in particular states,” Rainwater said. For example, Lafer said Arkansas and South Dakota were among several states in 2014 to raise the minimum wage by ballot initiative in 2014. Lafer said the first wave of workplace preemption laws focused on prohibiting localities from establishing minimum wages higher than the federal or state level, with Indiana enacting such a law in 2011. 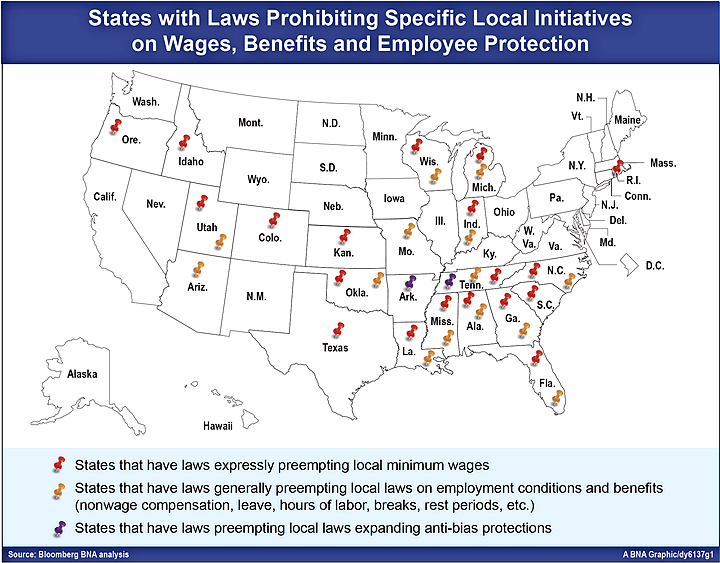 Nineteen other states now have similar wage preemption laws: Alabama, Colorado, Florida, Georgia, Idaho, Kansas, Louisiana, Michigan, Mississippi, Missouri, North Carolina, Oklahoma, Oregon, Rhode Island, South Carolina, Tennessee, Texas, Utah and Wisconsin. Since 2011, however, the preemption laws have broadened in scope to bar localities from passing laws on employment conditions and benefits, Lafer said. Still others have laws banning localities from extending employment discrimination protections to classes of applicants and employees not currently covered by state or federal anti-bias laws, such as lesbian, gay, bisexual and transgender individuals. Arkansas and Tennessee have enacted such laws. Can Localities Oppose Preemption Laws? Under the predominant legal standard on the relationship between states and localities, known as Dillon's Rule, “if a state decides that cities or counties are doing something that they weren't created to do … [the state] can legally come in and preempt them and take away that power from them,” Russell said. Dillon's Rule interprets a local government's authority narrowly in that a state government must expressly permit the locality's activity. According to the National League of Cities, 39 states employ Dillon's Rule to all municipalities. “Regardless of what cities and counties tried to do, courts have upheld time after time that states are in control of local jurisdictions,” Russell said. By contrast, the NLC said, only 10 states utilize what's known as Home Rule, under which state governments delegate specific powers to municipalities and allow for some local autonomy. Worker advocacy groups in at least one locality are trying to challenge a minimum wage preemption law on civil rights grounds. A group of fast-food workers in Birmingham, Ala., sued in April, alleging that a state law that preempts that city from enacting a minimum wage increase is racially discriminatory and violates the equal protection clause of the U.S. Constitution. The Service Employees International Union, which is the major force behind a national campaign to raise wages in the fast-food industry, is providing “technical support” for the lawsuit, but isn't a plaintiff, one of the plaintiffs' attorneys said at the time of the filing. But the Birmingham minimum wage ordinance, which would have raised wages in the city to at least $10.10 per hour, “would have had a significantly deleterious economic impact on the entire state,” Yerbey said. API generally opposes minimum wage increases, arguing that they hinder economic growth. “Tax revenue in Alabama is in large part clustered in three cities, with the city of Birmingham being by far the most important,” Yerbey said. “Whereas the state of Alabama cannot justify interfering with bad decision-making in Birmingham that only affects Birmingham, such as the part-time council members giving themselves a 233 percent pay raise, the state of Alabama can justify interfering with bad decision-making in Birmingham that significantly affects Alabama,” Yerbey said. Adler said the Supreme Court's ruling in Romer v. Evans, 517 U.S. 620, 70 FEP Cases 1180 (1996), potentially could play a role in challenging certain preemption laws. The court 6-3 struck down a state constitutional amendment that prohibited localities from designating “homosexual, lesbian or bisexual orientation” as a protected class. The majority found that the amendment violated the equal protection clause of the U.S. Constitution because it was based on animosity toward a class of individuals and wasn't rationally related to a legitimate government interest. Romer indicates that if a party can establish that the objective of a preemption law is to harm people, or to treat classes of people differently, then there might be a violation of equal protection or substantive due process, Adler said. He added that the plaintiffs in the Alabama case appear to be making those arguments. However, those types of constitutional challenges are “extremely difficult” to win, especially in the context of purely economic rights as opposed to fundamental rights, he said. Fundamental rights include those found in the Bill of Rights, as well as those recognized by the Supreme Court as protected by the 14th Amendment, including the rights to privacy, marriage and freedom from discrimination. Observers seemed split on whether the state-local preemption trend will continue for workplace issues. Huizar, however, said minimum wage preemption bills were introduced in at least 14 states in 2016 alone. Of those states, three—Alabama, Idaho and North Carolina—enacted them this year, she said. Richard Rouco, a Birmingham attorney representing the plaintiffs, didn't respond to Bloomberg BNA's request for comment for this story.